The weather may have taken a turn for the chilly this month, but the local creative scene is truly warmer than ever. I sat down with Alissa and Manuel before the Mos Def show at the Guthrie last Monday to talk style and to learn more about each of their creative projects. Lauren: I’m featuring couples for my ArielSimone blog posts – have you noticed any way that your partner has influenced your style? Alissa: I’ve noticed ways I’ve influenced his style. He already had some cool things to work with, but I think there were some things that he was wearing less so I just encouraged him to, you know, rock that shirt on a special occasion. But he has a lot of style on his own. When asked about his style, Manuel had a clear sense of what he represents through clothing and his particular swagger. Manuel: Southside. 90s. Casual. I don’t know, I honestly don’t think about it much, I just throw on whatever’s around. Lauren: Were you born and raised on the Southside? 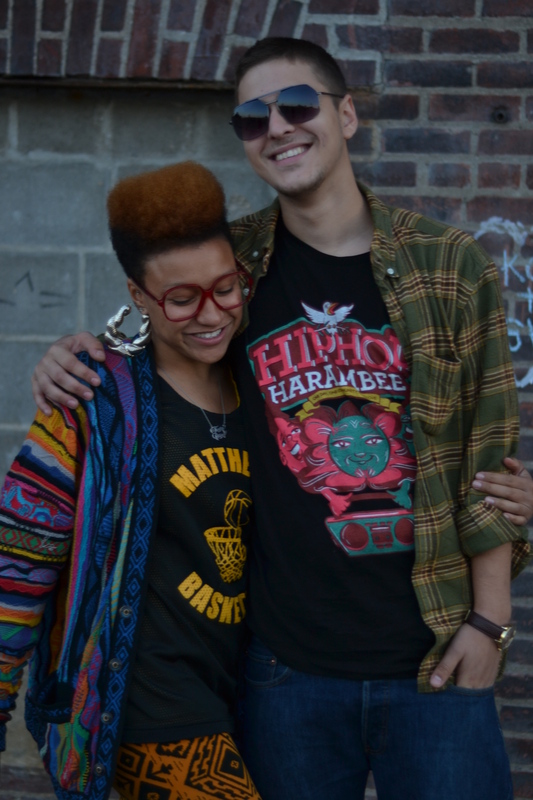 Lauren: So you rep that neighborhood – awesome … What’s a compliment that you’ve gotten either individually or as a couple from friends or strangers about your style or about you two in general? Alissa: Friends tell me that he’s pretty (both laugh). One of my good friends said, “yeah he’s pretty.” … Our families like us together. We’ve gotten Facebook comments on pictures from family members that I’ve yet to meet. Makes me feel special when they notice. And what about you, Alissa, with your style … because it is more eclectic? Alissa: Um, “are you from New York?” That’s like, that’s happened so many times in my life and it’s pretty funny. Yeah, “are you from somewhere else?” or “where are you from?” is usually how it starts. People comment on my hair a lot. They comment and touch my hair a lot. And, yeah, just“wow! Wow!” Or sometimes people just stop and stare and point. Lauren: And how would you describe your style? A: New Jack Swing. Fly Girl. Late 80’s early 90’s. Southside, definitely, Minneapolis. I grew up here. So everything that I took from the other places I lived as a child worked here. It was a free space where I could experiment with my style. There was no established Midwest look. Lauren: We’re here at the Guthrie for the Mos Def show. What are the kinds of things that you like to do together. Is this typical? What other things do you like to do? Lauren: Oh! That’s you!? I didn’t realize…. Alissa: … We’re working on going out and seeing our people more because that’s important to us. Lauren: Manny Phesto, what’s your music like? What do you want to do with it? Manuel: I don’t even know how to describe my music. It’s just…it’ s my music. You’ll have to listen to it. I just dropped an underground EP called Social Capital produced by the homie Julian Fairbanks from Audio Perm and other than that I’m just trying to do a lot more collaboration and work on a full-length, eventually. Manuel: Well, I was working on that Harambee for months and months so I put music to the backburner. Alissa: But it was awesome because he was also working on the album a little bit in the background, but he was putting this event together and he brought all of his friends into it, people were super supportive. Manuel: It was the perfect example of social capital. Good, and what about you, missy? Alissa: Yeah…. I’m a dancer, I’m an actress, I’m a singer, I’m a writer, I’m a stylist and first and foremost I’m a youth worker, I work with kids. It’s been like seven years now that I’ve been in the Minneapolis community doing after school stuff and trying to pull all of those things into it any skill sets that I have that would help what we were doing in the classroom so It’s been fun ….it’s fun that I’ve been able to bridge my worlds in that way. Great, awesome. Want to say anything about your outfit today? Oooh and I just noticed (your Fly girl Tattoo) this Fly Girl (concept) keeps coming up and you got this tattoo! A: A good friend of mine, a fly girl from Atlanta, did this tattoo. And, Rosie Perez is over here, I have her tattooed, she’s an activist, actress, Puerto Rican, comedian, dancer, she choreographed for the Fly Girls inIn Living Color. So, she’s one of my idols in the world for a lot of reasons … I’d say a lot of my friends come into my style. If I’m not thrifting for it and getting it as a gift from someone else who just gave it away … I’m getting it directly from someone. So a good friend Anna Lee Thomsicek she knotted this heart that I’m wearing. My Grandmother gave this to me, this Twin Cities sterling silver pendent. It’s supposed to be a couples pendent, you know – “Manny and Alissa”, but it’s Twin Cities. Lauren: And you described South Side being an influencer for you…I like to get a glimpse into how your identity, meaning race or ethnicity or neighborhood, how that comes into play, as well. Alissa: We’re both mixed kids and we both pretty much…well, I’ll say for myself we transcend…we work in a lot of different communities. I went to North High School, I stayed there all four years and I have a lot of love and roots in the Northside, as well…Northeast, the scoundrel nation kind of started there. I call him a South Side Scoundrel Prince. There’s a couple things playing into that, but I mean, we jump around, it’s Twin Cities for the most part, but Southside my roots. The west bank, that’s where I grew up and I think my style has a lot to do with that. The Guthrie, a hub for creative expression for artists of all kinds, offered a beautiful backdrop for our interview and photos. Both Alissa and Manuel’s spirits seem to parallel the river running alongside Mill District – at the same time that the river may look calm and soothing in certain places, the dam visualizes the power of water. Underneath the immediate surface there’s a lot going on – so much energy, force, and potential. Alissa and Manuel are the epitome of a power couple and I can’t wait to see how they continue to channel their energies in this beautiful city. Such a great show season and I cannot wait until show season in February! During that fashion week, my senior line will be on the runway for the U of M Senior Show! This week the designers meet Heidi at Babies ‘R Us where she introduces them to her newest venture Truly Scrumptious, affordable clothing for babies size newborn-24 months. The designers are then challenged to create a look for her line, the winning boy and girl look is going to be sold at all Babies ‘R Us as a part of Truly Scrumptious. Heidi provides the fabric and notions from her collection, then they are introduced their clients and given 30 minutes to sketch. 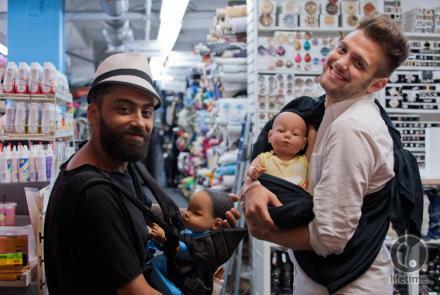 When they reach the sewing room they find a dossier of the current Truly Scrumptuous collection along with baby mannequins and mechanical babies that they have to take care of during the duration of the challenge. When Heidi comes in to check up on the designers she presents them with a twist, they also have to make an additional piece for the mother to wear in compliment to their baby’s look. She made a great sportswear suit, the cutest three-piece suit ever. Instead of traditionally making a suit of wool she made it with sweat suit material, making this look very wearable and comfortable. I love how she wanted him to look like a grown man, and her model Jude was the cutest baby ever. The mom’s look was gorgeous also, I would buy that look tomorrow if I saw it. Even though he had the most difficult, picky client, he did the best job in sticking to his guns and designing a formal set of floral dresses for both the toddler and mother. The femininity of both looks was whimsical and sweet, ultimately bringing him a win. This tight ruched dress didn’t work for the toddler with her diaper hanging out of the bottom. Unfortunately, the vest that she made was awesome, but this dress just didn’t work for the busy toddler. Melissa – The designers complain about her time management skills, she barely finished this week. Her designs in general just aren’t memorable, thinking back through the past episodes I literally don’t remember any looks that she’s done. I’m so excited for next week’s episode! The next elimination will bring the top designers to the Fashion Week collection and I can’t wait to see who goes home! This Monday, I had the opportunity to take a peek at Scott Ian McFarland‘s latest collection, which will be on the runways this Sunday for San Francisco Fashion Week. I had no idea what to expect and I was pleasantly surprised to find a small intimate gathering when I walked into Jillian’s. The venue was cozy, with dim lighting and wood-paneled walls that reminded me of a cabin in the woods. It was a classy affair with crudités, french bread, and cheese to snack on and waiters taking drink orders. I browsed through racks of men’s and women’s sweaters, cardigans, coats, beanies, scarves, and knit leggings and played dress-up with the models. The knitwear collection worked well as a cohesive unit and I was impressed by how easy it was to mix and match individual pieces. At first glance, the collection seemed basic, but upon further inspection, I discovered intricate knit work and lacing, interwoven braided ribbon, ruffled piping, and a palette of grays, deep indigo, and pearlescent hues. The first thing that came to mind when trying to describe it was Alice in Wonderland meets Where The Wild Things Are. The pieces possessed the effortless comfort of Max’s wolf pajamas and the whimsy of Wonderland. It was a match made in children’s book heaven. Most of the pieces were masterfully crafted by Scott Ian McFarland himself, a rare feat in a world where many fashion designers do not sew their own designs. As a formally trained sculptor, Scott brings a fresh perspective to the San Francisco fashion scene. He experiments with three-dimensional shapes, color, and texture in a way only a sculptor can. The inspiration behind Scott Ian McFarland’s latest collection is androgyny, the 1920s, ships, and the blues. Androgynous influences are obvious in the gender-neutral colors and silhouettes, while the 1920s shows itself in the form of loose-fitting cuts and breathable fabrics. The ruffled piping and knitted diamond-shaped patterns reveal ships’ masts and sails. But the blues? Really? I thought long and hard about how a musical genre could act as the inspiration for a clothing collection before I decided to do some research of my own. The term “the blues” comes from the use of the indigo plant in West African cultures during death and mourning ceremonies. The mourner’s garments were dyed blue to indicate suffering. The indigo plant was also grown in many plantations in the southern United States, where slaves sang of their suffering as they worked in the fields. These songs were called “the blues”. It was no coincidence then that Scott Ian McFarland used a deep indigo color to accent the neutral grays, pinks, and tans in his collection. Although Scott Ian McFarland is relatively new to the fashion world, I have high hopes for the new designer and I’d like to see how his clothing translates from the runways to the streets! Whew, sometimes it’s a tough one. But, recently I’ve found myself styling men more often than usual. It’s funny because when I was talking to my friend Bryon about wanting to style men more, he told me that I’d probably recommend polka dot pants! I actually wouldn’t mind seeing that on a guy, but as a starter… I styled a couple of men this past weekend and told one of them to wear a polka dot denim button-up. One of my really good friends, Nathan introduced me to Indochino, a custom online menswear tailor. He’s really into suits and the whole “Financial District” look, obviously. So, he asked me to help him style while Indochino had their traveling tailor here in San Francisco. I really fell in love with the variety of fabrics they had. You can basically customize the whole suit. From the lining inside to the lapels, and even the vents! Even though suits may seem very straightforward at times, there’s always a way to take it to the next level. With styling a lot of men and talking to them about their personal feel on suits, I’ve noticed that they forget to add color. 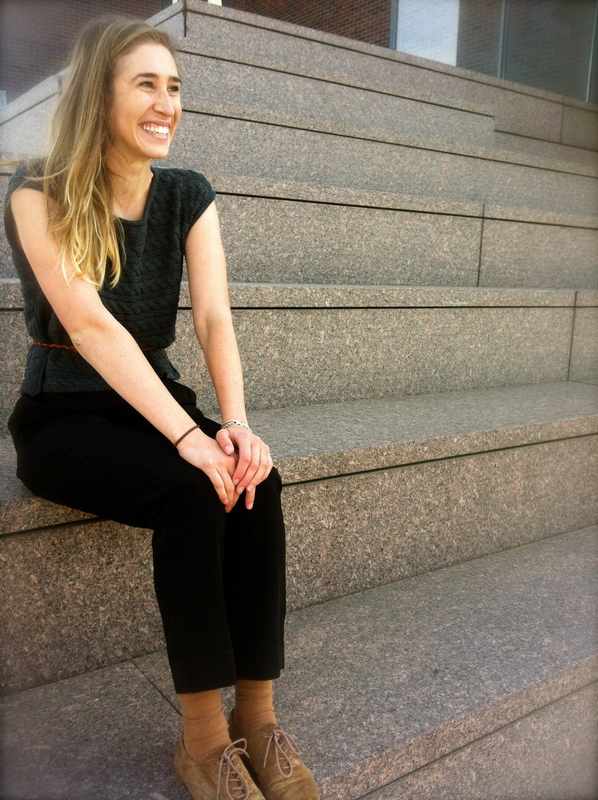 While moseying around one of my favorite spots in Minneapolis – the Walker Art Center – Chloe Nelson caught my eye. Admittedly, I was on the lookout for individuals who illuminated a kind of natural sense of style. I hoped to find someone who didn’t look as though she spent hours getting ready in the morning. Ms. Nelson, an employee in the Education and Public Programs department at the Walker Art Center, exudes a natural beauty aesthetic that fits into what I hoped to find. I spoke with Chloe about her experience as a recent Minneapolis transplant, her favorite things about fall, and her style choices. LM: With the changing seasons in Minnesota, there’s oftentimes an awkward transition. What do you like about fall? LM: And are you from San Francisco? CN: I’m from down the peninsula. LM: Some of our ArielSimone team is down in San Francisco. What is different here in Minneapolis verses in California when fall arrives? CN: Yeah, I would say that. I mean, San Francisco is different than the peninsula, obviously. But I would say people dress pretty similar in areas in San Francisco and Minneapolis, but obviously it gets a lot colder here so you need to brace yourself. LM: And this fall, is there anything that you’re doing particularly different for your style? CN: I was going to try to wear more neutrals. To wear greys and blacks and browns. CN: Which I’m doing today, I want to simplify my wardrobe. I’m trying to pare down my wardrobe, to make things have lots of different iterations. LM: Cool. And, how does working in a museum that is very contemporary, you know impact what you wear. CN: I think that you want to look nice. You know, I think you see a lot of cool clothes and interesting patrons and interesting art and I think that there’s constantly … just a creative energy that you want to … be a part of it. It’s encouraging, but it’s also very non judgmental, too. So I think that’s awesome. LM: Awesome. 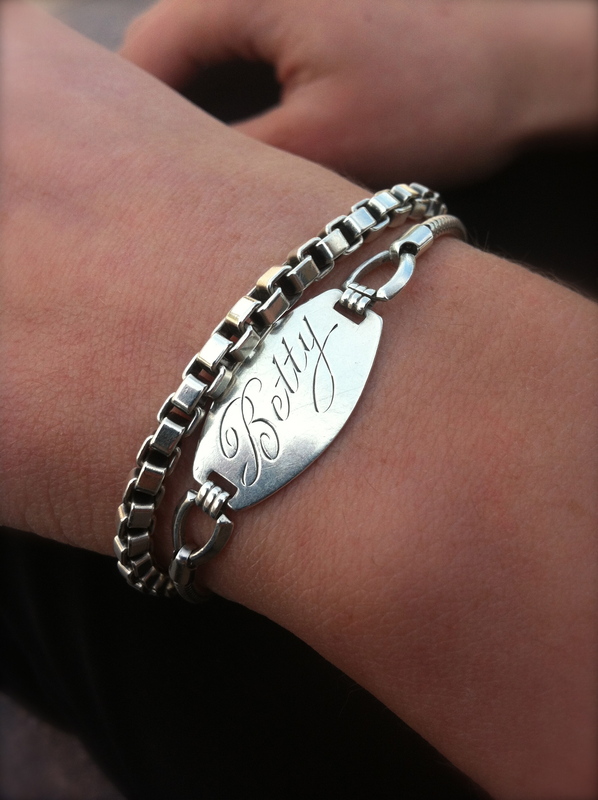 (Pointing to bracelets) Betty …. Who is Betty? CN: Betty is my grandmother. These are both from her. And this was a friendship bracelet with some of her friends. It’s from 1943. CN: And, when she passed away my Mom gave it to me. And a lot of people think it’s for like penicillin allergy or something, but…it’s just a little thing. I like delicate jewelry. Paralleling her love for delicate jewelry choices was Chloe’s overall unassuming, minimalist vibe from head to toe. She offers us a great reminder of the beautiful simplicity in going back to the basics for fall. This week the designers meet Tim at one of NYC’s major landmarks, Radio City Music Hall! They are introduced to the famous Rockettes who perform a short number. Heidi joins the kick line then announces the challenge: design a new costume for the rockettes. The winning costume will be produced and worn during a rockettes performance. Linda Haberman, the Rockettes director and coordinator, asks the designers to make sure to keep in mind the variety of events they perform at, so the looks need to be versatile, glamorous, contemporary and have a modern aesthetic. Past costumes are presented so they can be studied by the designers, then they are sent to mood for fabrics. At Tim’s initial visit, he’s so worried about the designers looks that he sends them back to mood with an extra $100 to get more materials, since sequins and crystals are so expensive, he wasn’t to make sure the designers amp up their looks. A few designers decide to stay back to work and not go to mood. He had a great idea and he ran with it! This is classic and beautiful without overdoing it! Dmitry’s background as a professional dancer definitely helped him in this challenge. His look is gorgeous and the movement is amazing! Sonjia was confused the whole challenge and it really showed in her final look. It’s unfinished and the feathers are obviously not the best to dance in. The season is almost over! Ven is gone, and soon they’ll be going back home to create collections! We can’t wait. ARIELSIMONE STRIVES TO PROVIDE GREAT QUALITY, CUSTOM AND HANDMADE CLOTHING TO YOUNG, FEMALE FASHION LOVERS AND TRENDSETTERS.